It tells guests what to expect when they arrive at your house. So, they can expect an outdated, sloppy experience while visiting your home, or, they can expect a well-kept home with an inviting atmosphere. It will positively or negatively impact your home’s value. It can improve the energy efficiency in your home. It can—and should—improve the security in your home with better materials and improved locking systems. Ok, the arguments for a new entry door are laid out. Now, how do you—a homeowner here in Toronto, ON—choose the right entry door for you and your home? 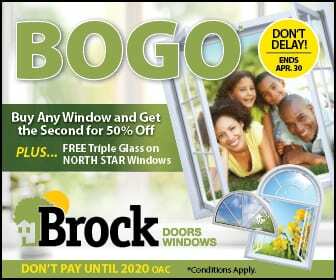 Let’s go over what the experts here at Brock Doors and Windows suggest! You can upgrade your home and your entry door within your budget. You do not have to choose the most expensive door, with the most outrageous installation fees and bank-breaking warranties. Yes, you want quality and you want a great installer and you do want warranties—but you can absolutely find something here at Brock that works for your budget and looks fantastic! Choose a colour you can live with! Material options and customizations aside—choosing the right colour will be the thing you think about, most, in the future. Experts encourage homeowners to stay within the general tint and tone of the exterior of the home—without being afraid to go bold! What kind of statement are you trying to make? Let that question guide you. All of this said, you will have the best odds of choosing the right entry door in Toronto, Ontario when you work with an expert, like those here at Brock Doors and Windows. They will be your co-designers and confidants through the whole process! Give them a call!